Thailand's most energetic seaside destination may be famous for its nightlife, teeming lanes, Walking Street alive with flashing neon lights and beaches swarming with tourists, but it also has a romantic side to it. When you feel like a reprieve from the throbbing city centre our hotels in Pattaya with private pool villa accommodation are offer the best escape on tranquil beaches. When you demand total privacy and blissful seclusion and the mood arise for a moonlight dip in your own pool, but you want to be able to easily access the most electrifying vibe in Thailand in no time, hotel accommodation does not come better than this. In addition, pool villa resorts cater to anything from a romantic honeymoon to 2 and 3 bedroom villas which can accommodate large groups at places like Thai Thani Resort which has an intimate setting 10 minutes from the city centre. For absolute seclusion hotels like Sea Sand Sun offers intimate accommodation on a quiet beach 25 minutes from central Pattaya. 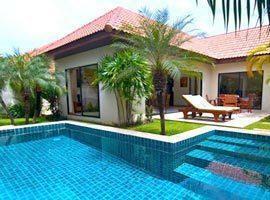 Costa Village is a short stroll from Jomtien Beach and set amid a fragrant garden. The resort has a Mediterranean Character complete with blue window shutters, private balconies and enclosed terraces to soak in total privacy. Located in north Pattaya Cape Dara features its own beach and guarantee quiet tranquility moments from the bustling city centre. 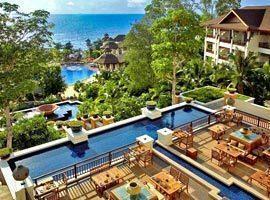 It offers an extensive fitness centre, romantic seaside dining for 2 and infinity edge pool with private salas. Near attractions like The Lake of the Temples, Na Jomtien floating market and Alankran Cultural Show this boutique resort has beach chairs reserved exclusively for its guests. Also features 2 and 3 bedroom jacuzzi suites. 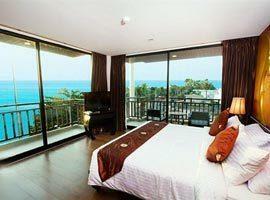 Located in Jomtien Ravindra offers family facilities such as a kids club and spacious 2 bedroom accommodation. 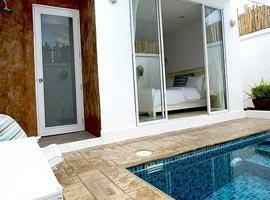 The residential style one bedroom villa includes an elegant separate living area and luxurious bathrooms. 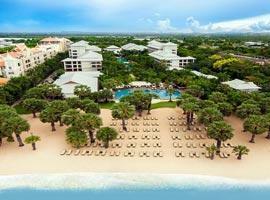 This boutique resort in Jomtien Beach boast enchanting views of Coral Island. It offers free Wi-fi internet access in its guest rooms, a salt water pool and a honeymoon suite with a jacuzzi which are ideal for romantic holidays. The resort is located 30 minutes to the south of the city. It features beachfront villas with Balinese gardens situated snug between the edge of a thick clump of trees and an immaculate ribbon of sand bordered by a placid ocean. 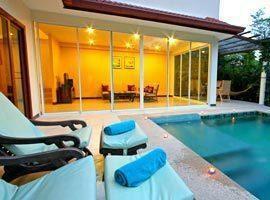 The one bedroom Baan Sai Chol and 2 bedroom Baan Sai Nam villa are the two options offering your own private pool. 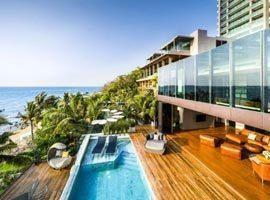 Both feature separate living and dining areas, a sun deck and both have oceanfront locations with stunning sea views. Situated 10 minutes from Pattaya city you not only have your own pool set in a private garden, but you can relax in it on an aqua bed and listen to the sound of your waterfall. There are also 2 and 3 bedroom villas with equipped kitchens. View Talay combine a Thai-Balinese theme with western standards in one and 2 bedroom accommodation which feature European kitchens. 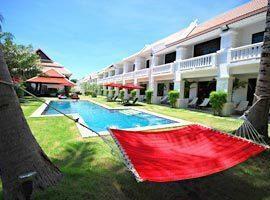 It is located 300 meters from the beach and 3 km from Walking street and Bali Hai Pier.